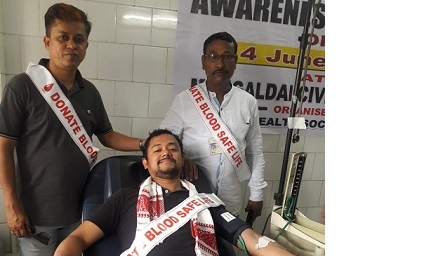 Along with other parts of the world, the World Blood Donors’ Day was also observed at Mangaldai in Darrang district on Thursday under the aegis of the Darrang District Health Society with a day-long event with participation of a Bollywood actor in the blood donation programme. The event included programmes like awareness rally, felicitation to prominent blood donors, seminar and voluntary blood donation. On this occasion, a public function was organized at the Mangaldai Cvil Hospital premises where several prominent voluntary blood donors and office-bearers of local Non Government Organizations including Sekhar Mazumdar of Crystal Vision, Nityananda Goswami and Dipak Deka of ‘Humanity’ and Nitish Kr Deb were felicitated in recognition of their selfless contributions to the society. During the function, presided over by Dr Jadumani Kataki, chief medical & health officer (CM&HO), Darrang, the speakers spoke about the significance of celebrating the day marking the birth day of Dr Karl Landstain, the Nobel Prize recipient scientist who discovered the ‘Blood Group’. The speakers included Dr Prasanta Goswami, additional CM&HO, Dr Ramesh Ch Goswami, SDM&HO, Dr Binod Kalita, SDM&HO, Dr Daud Ali, in-charge medical officer, Blood Bank, Mangaldai and Swarna Prabha Kalita, principal, GNM Training School, Mangaldai among others. This was followed by a voluntary blood donation programme at the Blood Bank where a section of members of Crystal and Humanity including NSD pass-out young promising Bollywood actor Mrigendra Konwar and Dipjyoti Nath, a popular actor associated with the mobile theatre group, ‘Hengul’, voluntarily donated blood spreading a strong message for the young generation to come forward and voluntarily donate blood to make the Blood Bank self-sufficient for any situation of emergency. Earlier on the day, an awareness rally was taken out through the Mangldai town with participation of the nursing staff, health workers, ASHA workers and others. Meanwhile, Harimon Deka, a teacher of Mangaldai College and adviser of Crystal Vision, who donated blood for record 61 times along with Pawan Sarma of Marwari Yuva Manch, Kharupetia, made Darrang proud for being among the top donors’ list in the State, who were greeted in a function organized jointly by Assam State Blood Transfusion Council (ASBTC) and Assam State AIDS Control Society (ASACS) at Sankardev Kalakshetra, Guwahati.